Happy Anniversary one and all - yes, today it's exactly one year since I started this blog and I must say the year has flown by incredibly quickly. Twelve months ago I hadn't played a game of full contact rugby for nearly 14 years and Brian Ashton, Gareth Jenkins, Pierre Berbizier, Eddie O'Sullivan, Mad Bernie Laporte, Jake White and Knuckles Connolly were all international coaches. 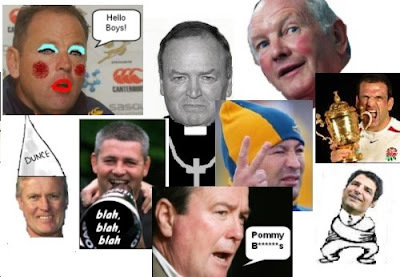 Furthermore, New Zealand were dead certs for the Rugby World Cup, the Aussies were claiming that Matt Dunning was a much-improved scrummager and the ELVs were just a minor irritation in domestic tournaments on the other side of the world. Not only is it a year ago that I started posting, this also happens to be, quite neatly, my 150th post of 2008 and my 365th post overall - which means that somehow I've managed to find the time to come up with some rubbish or other, on average, once a day (if you ignore the slightly inconvenient fact that it's a leap year this year). I can honestly say that I simply don't have the time to blog that often so can only surmise that somehow my computer is hooked up to some kind of space-time continuum which allows me to exist for more than 24 hours a day. Either that, or I seriously need to get a life. 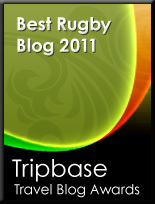 (Green and Gold Rugby.com) Blog sites before I even access Planetrugby.com, the BBC, ESPN or "The Australian". Happy Anniversary, pardner! Happy Anniversary TF. You do write bloody well.